Revive, Verb: restore to life or consciousness, regain life, consciousness , or strength. give new strength or energy. The name of the business has to do with the owners’ goal of helping revitalize downtown Clare, according to an article that appeared in The Morning Sun, a Mt. Pleasant newspaper And that is a fine goal. However, when I walk through its doors, I my goal is to revive ME personally, and that’s what it helps do. 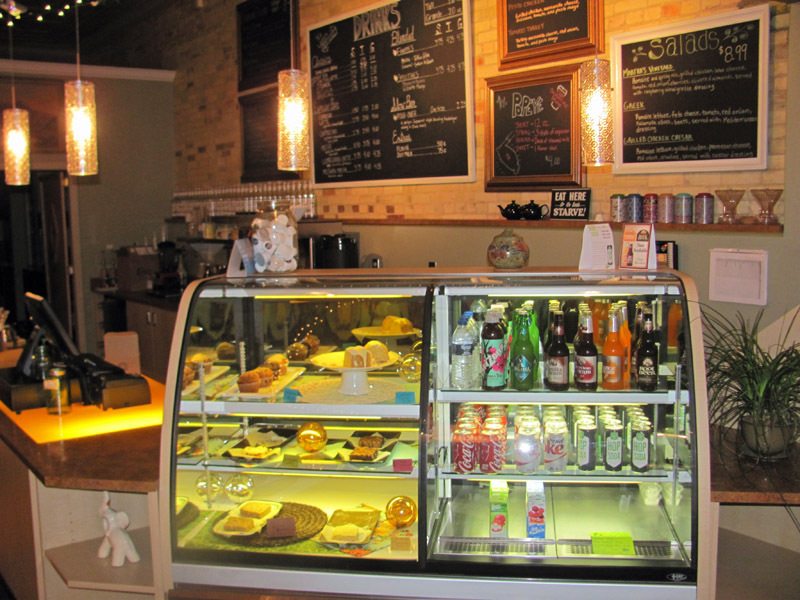 Revive a quiet, warm, and friendly place and one of the two owners– Lindsay Gunden or Lauren Manderbach—is generally behind the counter to pour my coffee. Sure, they have expressos and lattes, cappuccinos and the like, but when it comes to morning beverages, I’m a conservative, half-regular, half- decaf with a splash of cream kind of guy. While that’s generally all I get, I do sometimes order one of their tasty pastries that call out to me from behind their glass enclosure. If you are looking for a doughnut though, you will need to head a couple of doors north to Cops and Doughnuts. The owners of Revive know better than to go head-to-head with Cops, Clare’s top tourist attraction that offers, along with fresh doughnuts (or in my case, day-old lemon filled) bright lights, a steady flow of people, merchandise, and sometimes long lines. Don’t get me wrong, Cops is a neat place and I hang there on a regular basis. Sometimes I am even invited to sit at the big table with the regulars. But I’m not always looking for lots of people, noise and congestion along with my caffeine. Sometimes I crave a bit of peace and quiet; a place to talk without interruption. Sometimes I even want to sit at a private booth inside an elevator. If so, Revive is the place I go. 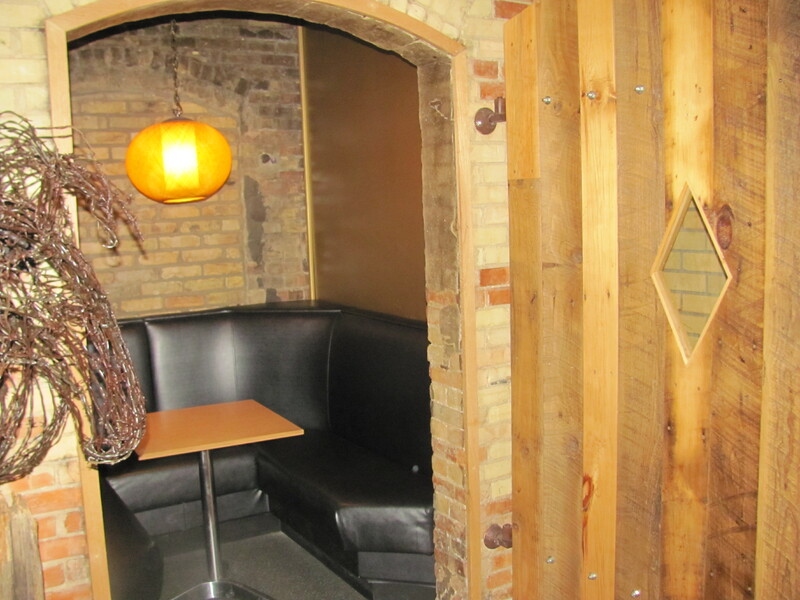 Yes, a booth inside an elevator, complete with its big oak door. The elevator itself has been removed, and yes, the floor is secure. So, c’mon by. And if you see an older guy with glasses hunched over a computer screen sipping on a half and half with cream, stop by. I like peace and quiet but company is always welcome. 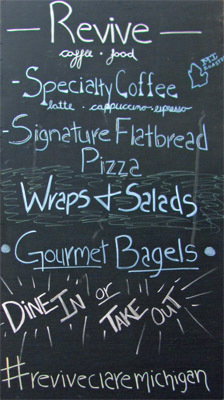 BTW, Revive offers more than just taste early morning goodies like pasties and bagels. The place also serves lunch and the food is good and fresh. 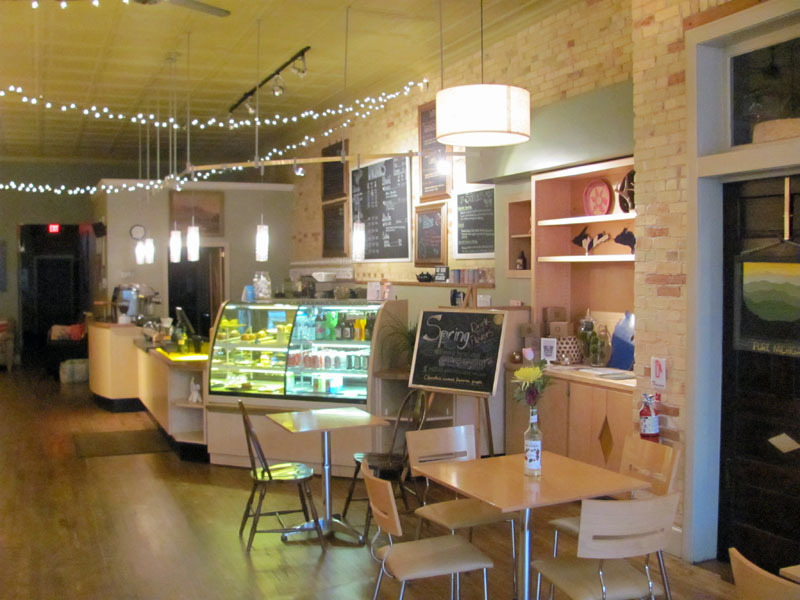 Revive is located at 505 N McEwan St. in Clare. Hours are Monday-Friday 7 a.m. – 4 p.m., Saturday 8 a.m. – 4 p.m. Find them on the web at and on Facebook.